Monty Python fans in a Devon resort are to be given the chance to watch a classic comedy film, nearly 30 years after it was effectively banned there. When The Life of Brian was released in 1979 Torbay Council said its AA rating (ages 14 and over) was unsuitable and wanted it reclassified for adults only. The film's distributors refused, no compromise was reached and the movie was never screened in Torbay. New advice was taken after the movie won a poll ahead of a film festival. After The Life of Brian won an online vote to be shown at the English Riviera International Comedy Film Festival, Torbay Council sought legal advice and decided the 1979 ruling had been redundant for a number of years. The council said regulations which had allowed a local authority to look at the age ratings of films changed more than 20 years ago, but to its knowledge no-one had asked to show the movie in the area until now. A council spokeswoman said the authority had made the decision in 1979 "to protect the people in Torbay" after concerns were raised about the film's content by some local residents. Matt Newbury, one of the team organising the festival, said: "We only became aware that there could be a problem after an informal chat with our MP Adrian Sanders, who remembered that the film had in effect been banned all those years ago." The movie tells the story of Brian Cohen, a young Jewish man born at the same time and in the same place as Jesus Christ, who is frequently mistaken for the Messiah. Some Christians, particularly those on the evangelical wing of the church, argue that the comedy is blasphemous. The Monty Python team have always rejected such accusations. 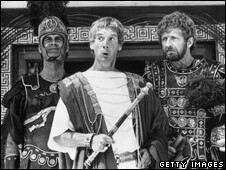 Michael Palin, one of the writers and stars of the film, said: "I was interested to read that the ban on Brian was to protect the people in Torbay, as Torbay had already been infected by Monty Python. "A long sketch, Scott of the Sahara had been filmed on Paignton Beach, and of course, famously, John Cleese got the idea for Fawlty Towers from a Torquay Hotel." Torbay mayor Nick Bye said: "The world has moved on. I haven't seen the film but I welcome its showing on Sunday." A British Board of Film Classification (BBFC) spokeswoman told BBC News that under the 2003 Licensing Act, local authorities still had the power to overrule BBFC age gradings. The Life of Brian on DVD is now classified as suitable for people aged 15 and over.